Our newly improved Screen Wash 1000 is faster, safer and most of all less expensive. Screen Wash 1000 is an organic product developed for faster screen cleaning and priced at half the cost of existing safety solvents. Formulated for use in dip tanks, manual application as well as automatic screen washers such as Screenpro's and other makers. Screen Wash 1000 is a non-toxic, non-flammable, water soluble, biodegradable, drain-safe organic product. Designed to quickly remove plastisols, vinyls, poster inks, plastic plus, legend inks, thermal and UV solder mask, solder paste and acrylic poster inks and many more. Flammable thinners, Lacquer Thinner, Mineral Spirits, Butyle Cellosolve, Xylene, Acetone, Methanol, Tolulene, 1,1,1-Trichloroethane, Methyene Chloride and Methyl Ethyl Keytone products which are all flammable, toxic or polluting. 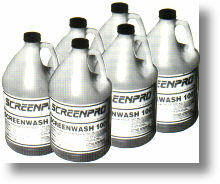 For best results Screenpro Screen Wash 1000 should be used as received; do not dilute. Screen Wash 1000 should be used at temperatures between 70 and 85 F. Do not heat. Screen Wash 1000 is safe for use with equipment constructed of polyethylene, polypropylene, and stainless steel. Screen Wash 1000 is a clear liquid with a flash point of 212 F (COC). The density is 8.33 lbs. per gallon with a neutral pH. 6 one gallon, 5 and 55 gallon polyethylene drums (the 55 gallon empty drums make excellent shop trash cans with the top removed). Store in original, sealed containers between 50 and 90 F. Do not store in direct sunlight. Rinse waters may be disposed of in a biological waste treatment facility, as permitted by law. Spent material may be incinerated, disposed of at licensed dump site or recycled by using one of Screenpro's Solvent Recycling Systems. Avoid contact with eyes, skin, and clothing. Read and understand this product's Material Safety Data Sheet before use.